Think Spinach Pie without the crust... tastes just like spinach pie filling! Works equally well for a holiday appetizer or meal prep for easy breakfast or snack. Savory, packed with nutients and delicious! 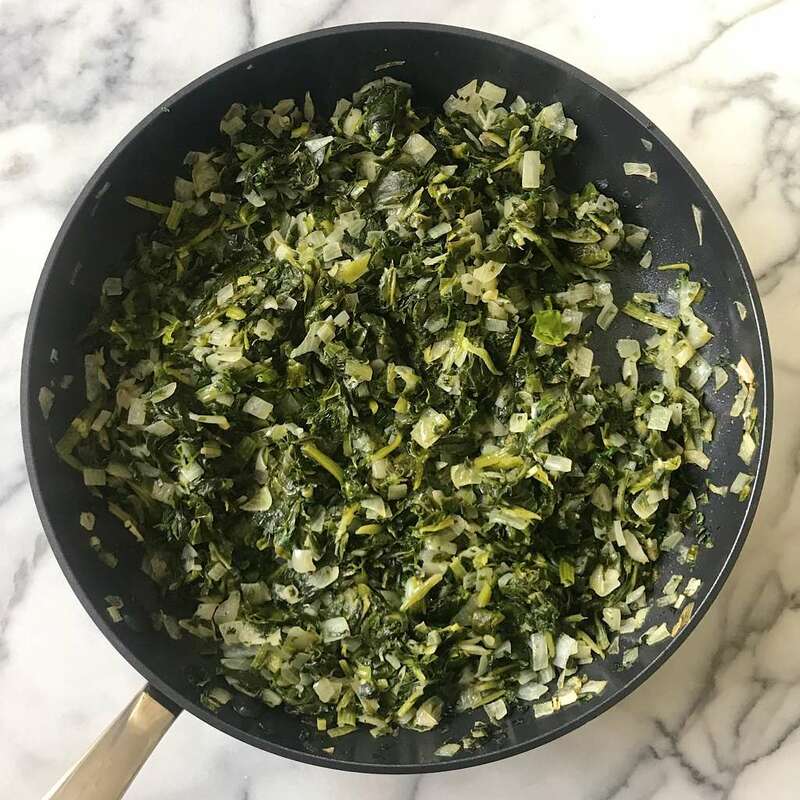 Several years ago, a friend developed this recipe for us because my son missed eating traditional spinach pies after being diagnosed with celiac disease. 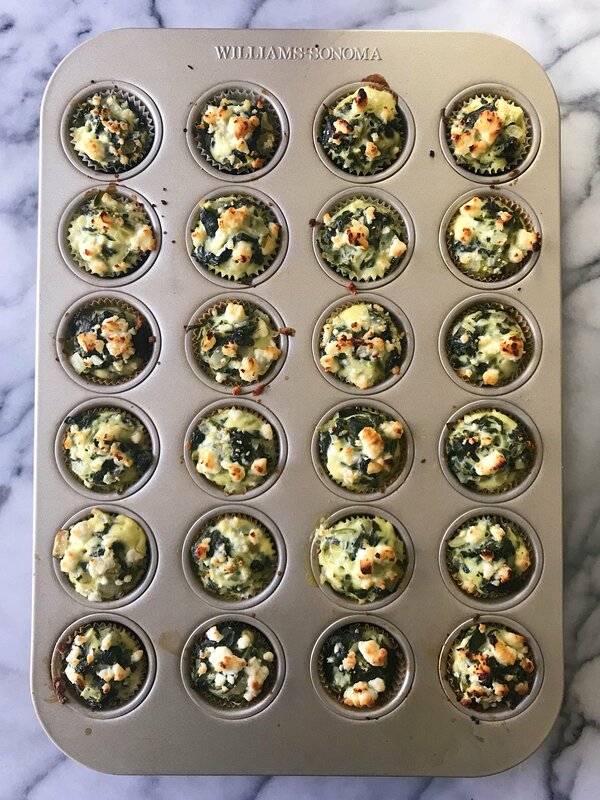 They are essentially the spinach pie filling baked in mini muffin tins, and they’re AMAZING! Savory and delicious, they have become a holiday appetizer tradition for us. They are made with 7 real, whole food ingredients plus spices– salt, pepper and nutmeg which livens up the flavor and gives a real warmth. 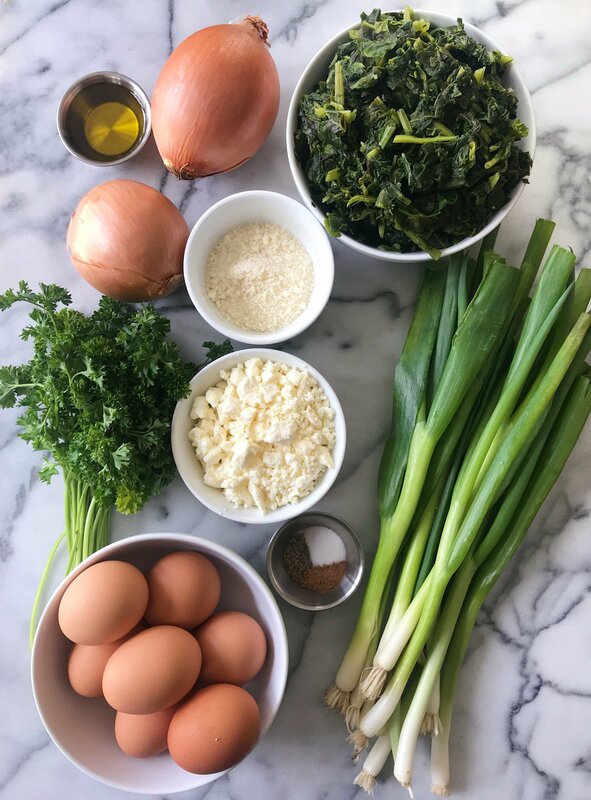 All you’ll need is spinach, onions, green onions or scallions, eggs, feta, parmesan and parsley. First you saute the onions with olive oil. Add in the spinach and parsley, and saute until the spinach “dries”. Then season with salt, pepper and nutmeg. Meanwhile you mix together the eggs, feta and Parmesan. 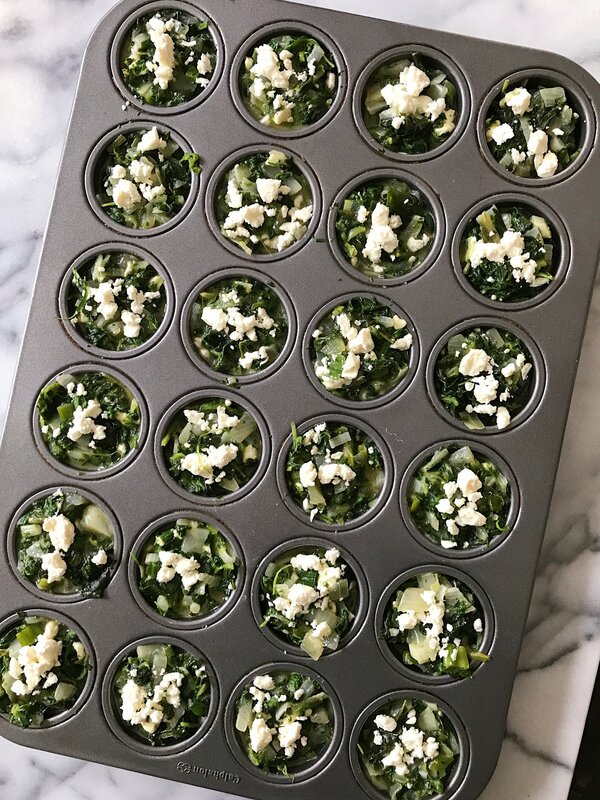 Add the spinach mixture, and then scoop the combined mix into muffin tins and top with extra feta. The baked feta is the best finishing touch! A few baking tips… to get the edges crispy bake directly in the baking tins. Just be sure to coat the muffins tins with olive oil or a spray oil. Since cleaning muffin tins can be a bit challenging to clean up though, I like to bake them in muffin cup liners. As for the muffin cup liners, I have always If you care recycled paper liners and they’ve worked perfectly. The last time I made them, I used a different brand because I could’t find my usual and they stuck to the muffin liners…. so I highly recommend spraying the muffin liners with a cooking oil. For entertaining we like to use mini muffin tins. And you’ll get about 36 mini spinach pie bites. Alternatively you could use full size muffin tins and you’ll get about 16. These work really well if using for meal prep as a grab and go breakfast or easy lunch or snack. They freeze well, so I make them a week ahead when hosting an event . And we love having leftovers because they are great with breakfast, brunch, lunch, snack or basically any time! 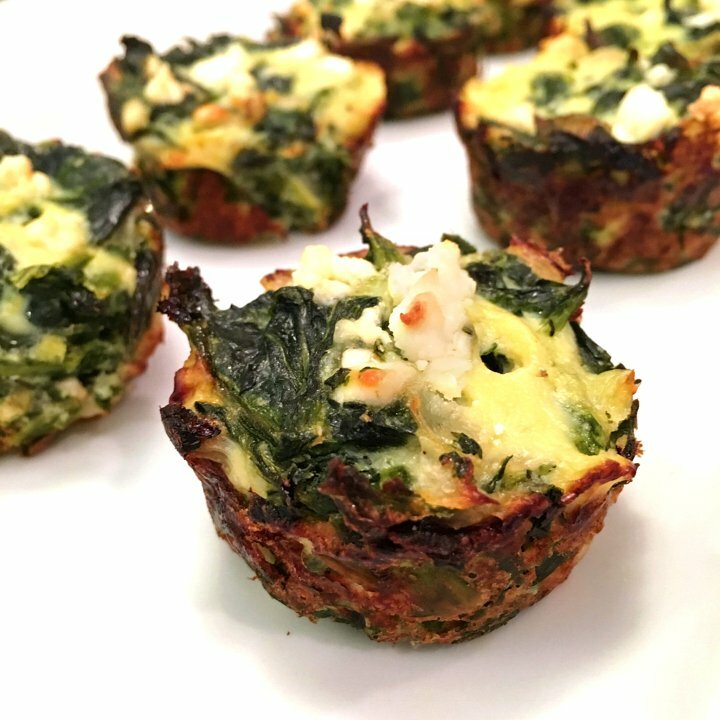 Think spinach pie without the crust... Savory, delicious and packed with nutrients, they are made in mini muffin tins and make a great snack or appetizer. They freeze well so I make them a week ahead when hosting an event. Wash and drain the chopped spinach very well. Heat olive oil in a deep sauté pan. 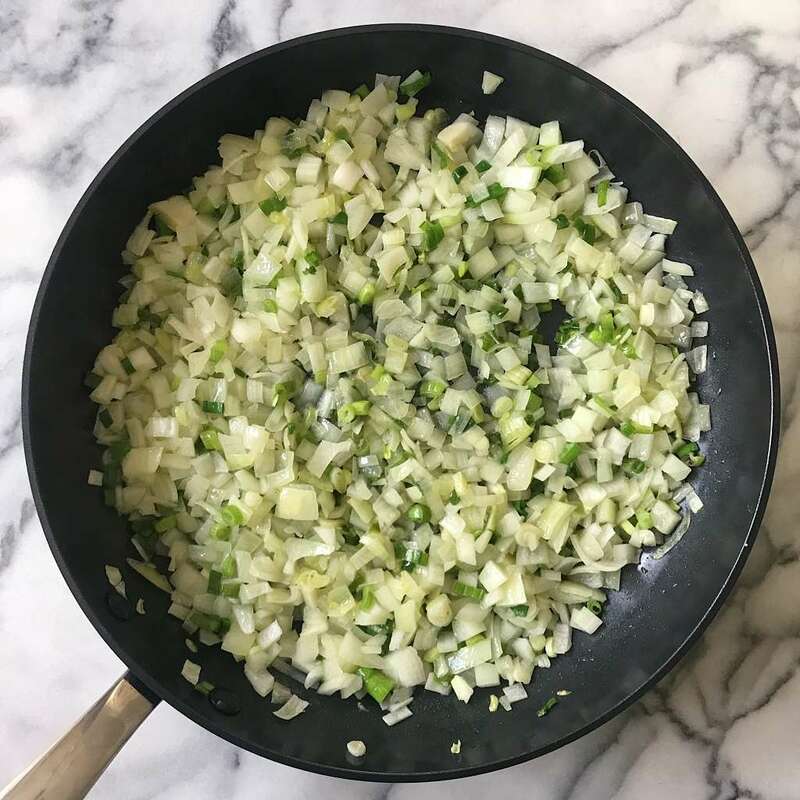 Sauté onions and green onions until tender. Add the spinach and parsley, cook for 5 to 10 minutes on low, until the spinach is totally dry. Add the nutmeg and season with salt and pepper. Set the spinach aside to cool. Combine the ½ cup feta, parm and eggs. Add the cooled spinach mixture to the eggs and mix until combined. Before placing mixture in muffin tins, spray muffin tins liberally with a spray oil or line them with baking cups to make clean up easier. You might want to consider spraying the muffin liners with oil as well to make sure they don't stick. Bake at 350° for about 20-30 minutes, or until eggs are set. Serve immediately or store in refrigerator for a few days or in freezer for several months. Reheat frozen bites in oven or microwave. We prefer oven. These are so delicious and surprisingly easy to make! It was the perfect additon to our brunch party. They were very popular! Yay! So happy to hear everyone loved them and that you found them so easy to make!